She went to a convenient store and slipped, injured her left foot. Apparently, according to some reports, her recovery isn't going too well. In a few first event since her injury she was sitting in handshake event but still dancing despite the injury, and at the next round of events, she's still sitting while handshaking but now can only stand while singing, she also had to be carried on the staff's back to move around which probably means even walking was a no no. If you watch this week's Hello! Station, near the end, where Sayu was talking with her, you can see it was filmed in weird angle and she moved kind of unnaturally, she's actually being carried on a staff's back.. ^^; You can see the staff's head just a bit. Because of this though, looks like she has to be separated from the rest of the girls to another dressing room. Tasaki Asahi once posted a pic with Karin saying that they are in the same dressing room with Aika in Hello!con. I guess there's some kind of treatment like taping or something that require her to be put in less crowded room..
On August 23, it was announced that Miyamoto suffered a left cuboid bone fracture, she is expected to be fully recovered in six weeks, until then, she will not be able to dance in Juice=Juice activities. On September 15, staff reported that Miyamoto was in poor condition and couldn't participate in a Juice=Juice handshake event, and in the Hello! Pro Kenshuusei Happyoukai 2013 ~9gatsu no Nama Tamago Show!~ that day. Miyamoto will graduate from Hello! Pro Kenshuusei in September 2013, after Juice=Juice's major debut. Karin~! NOOOOO!!! I love her so much. And she's still so young, too~! Wish for the best in your health, and some good luck in your future career. You are jumping the gun here, your reaction makes it look like you think Karin is quitting being idol completely, however there's nothing to indicate that she's doing that. Notice the part that I've bolded in red. All that means is that Karin, along with the other Juice=Juice members, will no longer be Kenshuusei (i.e. "trainees"). It does NOT say that she's quitting H!P altogether. Strictly based on what that Wikia entry says, there is nothing there that would suggest that Karin will be leaving H!P anytime soon. If you look at the profile pages of the other Juice=Juice members on that Wikia, you will find that same quote about graduating from the Kenshuusei on the profile pages for Kanazawa, Takagi, and Uemura. Miyazaki joined H!P as a soloist, and was never a part of the H!P Kenshuusei to begin with, so her page does not have that quote. By having their major debut, they will no longer be considered trainees and are basically being PROMOTED to full Hello!Project member status. Her "future career" is, and will continue to be with Juice=Juice, as full-fledged H!P members. We just have to wait for her injury to heal to see her rocking the dance steps on stage again. I gotta admit that I got worried when I read Ruka's post, I had to check the other sites just to be sure. Flyers were distributed at JJ's release events a few days ago. They are the members' own 'history'. 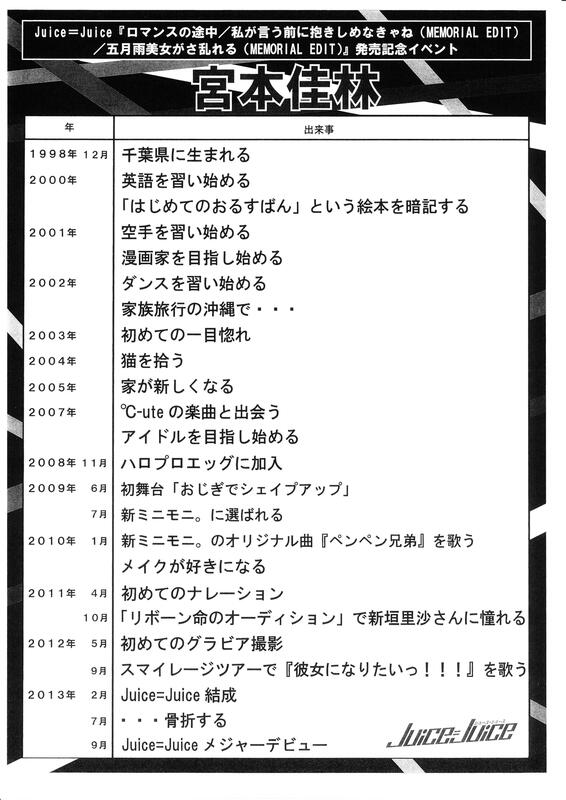 2009 June First stage play "Ojigi de Shape Up"
2010 January Singing Shin MiniMoni's original song "Pen Pen Kyoudai"
October Start admiring Niigaki Risa-san since "Reborn Inochi no Audition"
A truly beautiful young lady, inside and out. Talent and sincerity never goes out of style! Wishing her a wonderful year ahead, filled with love and joy!! A couple of inappropriate ones, a couple of LUL-zy ones, and at least a couple of "WTF?" ones. 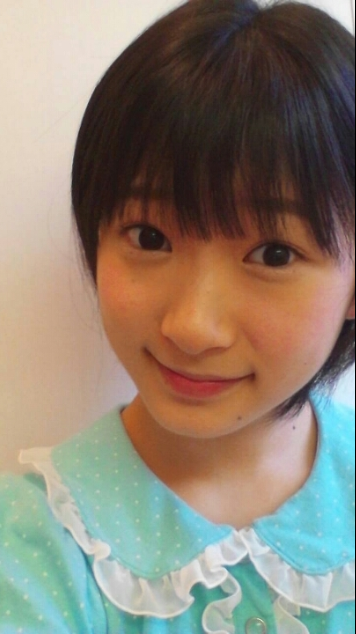 Juice=Juice Miyamoto Karin talks, "My rival is MoMusu. '14 Oda Sakura"
For Miyamoto-san, is there any member in the same generation that makes you think, "That girl is amazing", "I don't want to lose to that girl"
Yu~p, my rival is Morning Musume. '14's Oda Sakura-chan. We're both the same age, and we both come from the same background of the Hello! Pro Kenshuusei. Even from when she was a Kenshuusei, her expressiveness when singing was amazing. It's not about winning or losing, I think I'd like to polish myself to that level of expressive power. Also, though Hello! Pro Kenshuusei Danbara Ruru-chan just just joined, but she's really good at singing! Though she's still in primary school, her voice is mature. I was surprised with how remarkable good she was, were I to compare with myself when I was in primary school, I'd be no match for her. But, with my feelings of wanting to surpass those two, I think I'd like to do vocal training every day. Is there anyone you don't want to lose to from the dancing aspect? 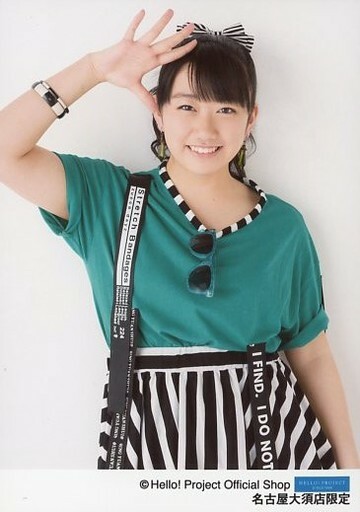 Sato Masaki-chan. Her sense of rhythm is extremely good, and even when she's singing, she doesn't slip out of rhythm. When it comes to the aspect of rhythmical sense, I want to work hard in order not to lose to Masaki-chan. Q1. What's a moe point of a Hello! Pro member that only you know of? The movements of her fingers when she's handling a file! I really love Take-chan's fingers! When she's flipping through a file, it's really exquisite. Perhaps I like the shape of her nails too. I like it when they're slightly stretched out. So when she's going through a file, my heart skips a beat. I think that it's very Japanese. Q5. If you would be so kind to think of it, Hello! Pro's best couple would be? They wear matching jerseys, and seeing them together at Hello! Cons always soothes me! At handshake events, I'm asked, 'Doesn't it make you burn with jealousy? ', but I'm not jealous at all. I feel like I'd like to watch them instead. The 2-shots on their blogs are awesome!! 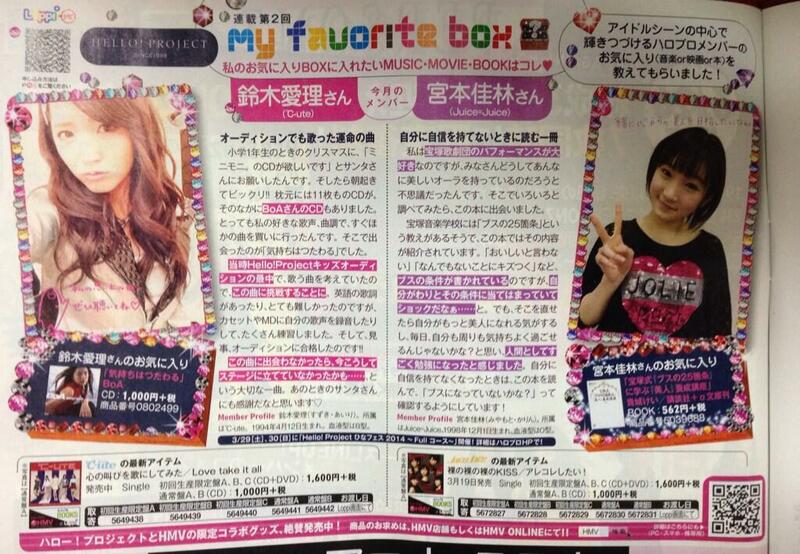 Friday magazine is calling Miyamoto Karin "The 2nd Ayaya"
I love Karin, but I don't think there can be a second Ayaya. Not to mention that Karin is in a group, and I don't think anyone in a group can be a 'second Ayaya'... An 'Ayaya' would need to roam free solo. :3 I'd love to see H!P give a try for another solo artist tho.